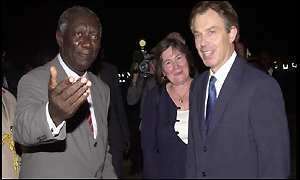 Accra, April 20, GNA - President John Agyekum Kufuor would confer with British Prime Minister Tony Blair on bilateral issues between the two countries in London on Monday, April 26. Mr Kwabena Agyei Agyepong, Press Secretary to the President, told Journalists after a closed-door meeting between President Kufuor and the British High Commissioner in Ghana, Mr Gordon Wetherel at the Castle, Osu on Tuesday. Mr Agyepong said the meeting in London would centre on Ghana's economy and Britain's continued support to the Government on the Highly Indebted Poor Countries (HIPC) Initiative when Ghana reached the completion stage this year. He said Mr Yaw Osafo-Maafo, Minister of Finance and Economic Planning, who was currently in the US attending a meeting with officials of the International Monetary Fund (IMF) and the World Bank would join President Kufuor in London for the meeting, where Britain was expected to announce some financial assistance to Ghana. Mr Agyepong, who is also the Presidential Spokesman, said after the meeting in London, President Kufuor would travel to Pretoria, South Africa to attend the swearing-in ceremony of President Thabo Mbeki for a second as President of South Africa and participate in the 10th anniversary celebrations of South Africa's Independence.